From the point of view of variance between Vaidic tradition and later day Bauddha School on the concept of reality, this mantra provides an interesting insight. Bhagwan Veda as knowledge sees universal existence in terms of cosmic ‘Godliness’; something that pervade creation from within and without. If existence of such God is experienced one verily becomes that because after all He is the supreme and substratum reality of all. The projection of God over and above ‘godliness’ that is more accessible through devotion and love was explored fully by later day Bhakti schools. Here Rasa and Bhava took preponderance over intellect. 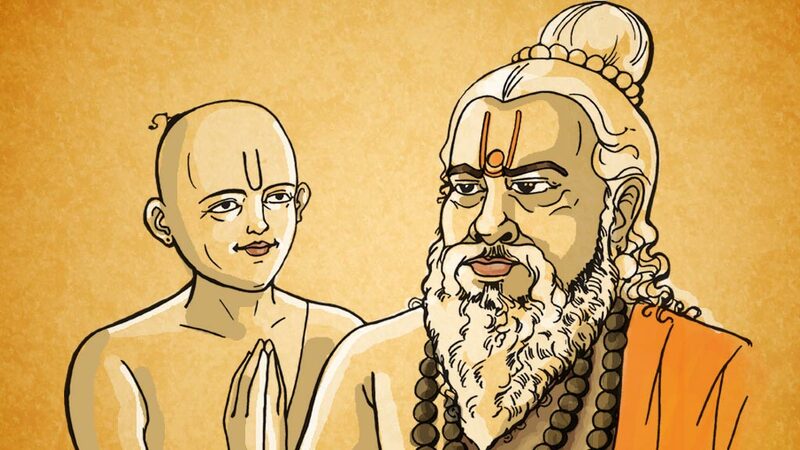 Thus, there is a great deal of difference between the experiences of a Vaidic Brahmana and Smarta Brahmana worshipping Ganapati with Sri Ganapati Atharvashirsha. Both Purva and Uttar Miamansa schools have tried hard to adhere to this Vaidic conception while maintaining their focus on more mundane issues at hand and holistic divine Order (rta) at heart. They steadfastly avoid crystallization of abstract concepts; which is only way for creation of image of Godhead. The ‘Godliness’ metamorphise into Sri Ganesha’s Vigraha from from Ganapati Atharvashirsha. In the Taittiriya Upanishad quoted above, the preference of Vaidic seer is clear. They don’t see non-existence as virtue. The preponderance to knowledge implicitly means greater emphasis on the phenomenal world, though the Vaidic ‘world’ is different from the phenomenal world that we are acquainted with. The secret of Buddha’s Anatta and later day Shunya lies in the conception of Nirvana without Ishvara. In search of Nirvana, Buddha appears to have discounted the unity of existence; which was hallmark of the Vaidic thought. Recognition of connectedness of existence and understanding of reality on three planes: the visible, the divine force behind the visible and the unitive supreme behind all make Vaidic paradigm a consciousness elevating thing. Since Buddha saw reality in terms of causation and dissuaded some categories of enquires, it restricted to scope of vision. We know that Buddha in spirit of a true Aghora-Avadhuta was much reluctant to impart knowledge to humanity. He had to summon compassion to persuade himself to spread his thought. In Buddha’s tradition attainment of Nirvana or Supreme truth remained individualistic concern with little concern with the society. Buddha attracted Shramana of various denominations and heretic-individualistic seekers. He brought them under one canopy. Vaidic thoughts existed in various philosophical schools but the linking holistic vision had been lost. No wonder if Srimad Bhagvata claims Buddha to be an incarnation of Vishnu’s to deceive and delude the enemy of gods from the performing Vaidic rites. Interestingly the Vaidic Brahmanas would have little interest or reverence to a concept of Avatar of Vishnu in the first place. Sanatana tradition accepts existence in widest possible sense; thus overlapping identities and multiple associations are natural way of life. It is quite possible that as far as conception of reality is concerned, Mimamsakas can empathize more with Bauddha schools; can understand them better than Japanese Buddhists. And a Brahmana adherent of dualist school (even giving preponderance to Bhagvata School over Veda in his belief) in all practical sense could be a steadfast upholder of Vaidic tradition. Watertight compartmentalization which is so characteristically present in Abrahamic religious tradition is virtually non-existent in India.